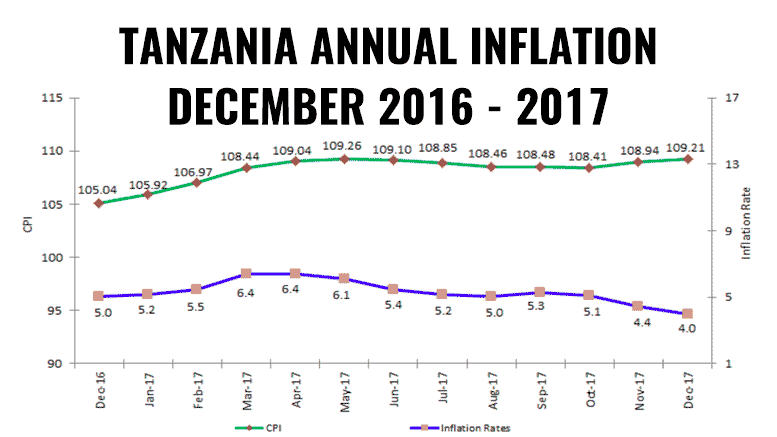 The National Bureau of Statistics of Tanzania (NBS) indicates that the Annual Headline Inflation Rate for December 2017 decreased to 4% from 4.4% recorded in November 2017. The overall index went up to 109.21 in December 2017 from 105.04 recorded in December 2016. Food and Non-Alcoholic Beverages Inflation Rate for the month of December 2017 has further decreased to 6.2% from 7.4% recorded in November 2017. In addition, the 12-month index change for non-food products has slightly decreased to 2.8% in December 2017 from 2.9% recorded in November 2017. The Annual Inflation Rate which excludes food and energy for the month of December 2017 has decreased to 1.3% from 1.4% recorded in November 2017. The Consumer Price Index from November 2017 to December 2017 has changed by 0.2%, compared to a change of 0.5% recorded in November 2017. The overall index has increased to 109.21 in December 2017 from 108.94 recorded in November 2017. The increase of the overall index is mainly attributed to the price increase for both food and non-food items. Some food items that contributed to such an increase include; maize flour by 1.3%, beans by 1.6% and round potatoes by 4.1%. Non-food items that contributed to such an increase include; boy’s shirts by 1.4%, women’s trousers by 1.1%, kerosene by 0.4%, diesel by 2.0% and petrol by 1.9%. Annual Average Headline Inflation Rate (from January to December 2017) has slightly increased to 5.3% in 2017 from 5.2% recorded in 2016 (from January to December 2016). This increase was mainly attributed to the increase in prices for both food and non-food items. Annual Average Inflation Rate for food Items increased to 9.6% in 2017 from 7.6% in 2016. In addition, Annual Average Non Food Inflation Rate for 2017 has increased to 3.2% from 3.1% recorded in 2016. On the other hand, Annual Average Inflation Rate which excludes food and energy has decreased to 2.0% in 2017 from 2.6% recorded in 2016.